Big Log Cabins – What to consider first? Big log cabins are on the increase, but there are some particularly relevant aspects you should think about first. If you are lucky enough to be looking to build big log cabins, then there are plenty of choices to make. The designs, in terms of the shape and layout, have a lot of possibilities. This then may have certain structural implications, depending on how big and open a structure you are looking at. Greater space and budget may allow for certain design features to be introduced too. High impact great rooms or other internal features can be used to great effect. The log sizes and types may influence your design flexibility so this needs think about. Also big log cabins need a lot of space for delivery of materials and the construction process, so ensure you plan this carefully. The logs you choose may have an impact on the overall design possibilities but they will also influence the overall appearance too. If you are looking for a rustic log cabin with a real “wow” factor, then large hand scribed logs are going to achieve this, the best. However if you are going down the machined log route, I would suggest you use as thick logs as you can. This not only gives more strength but logs which are too small on a big log cabin, will not look great. The smaller the log, the weaker they will be and so this may reduce the maximum spans you can achieve as well. Laminated log will help in this respect, but if you are trying to achieve and more complex, open design, always check the log size you are looking at will be suitable. Many people building a large and luxurious log cabin want to create a real statement with their overall design. 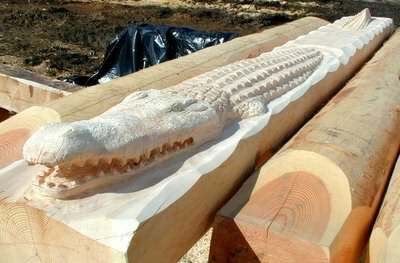 There are many way this can be achieved, such as massive glass areas, big roof overhangs, huge beams and posts, feature chimneys, hard carvings on the logs, unusual shapes and angles and many more design features. Choosing which you may like to incorporate within your design, will depend on your budget and what you are trying to achieve. 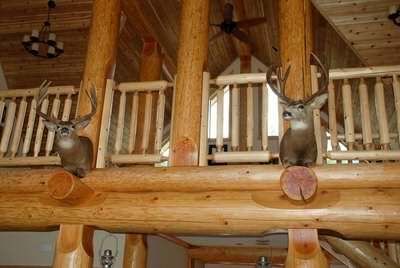 For example a log cabin which has wonderful views, it would be great to maximize these using lots of glass. 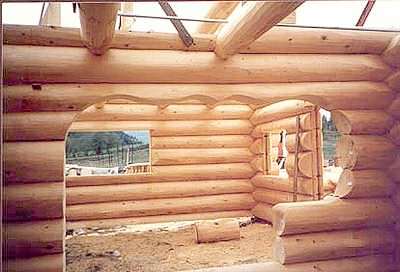 You could create unusual shapes, to optimize your aspect from certain sections of your log cabin. Whatever you decide to do, the log cabin design will need to work structurally. If your log cabin is a large custom design, it is likely some structural assessment will be needed in the early stages. Especially structures which have very large open designs, with big spans, will need looking at in some detail. Make sure that your architect or designer, either has the answers, or is liaising with a structural engineer to get things right. Always be mindful that your roof design and choice or roof tiles can have a significant impact on the roof structure itself and it is therefore sensible to discuss these areas at the start. Also log cabins rely on walls intersection between opposing log walls, to give rigidity and overall strength to the structure. Therefore if you are thinking of having a massive open room with no other intersecting log walls in, you may have to introduce logs as ceiling ties, to lock the structure together. Large post and beams can also be used as design features, as well as providing extra strength to the structure where it may be needed. Internal features can have a huge overall impact on the interior of your log cabin. Think carefully what type of features you would like to have and then make sure if they impact on the overall design, this has been factored in. Impressive stone fireplaces and chimneys, can give a lovely focal point to a log cabin, with the stone providing a beautiful contrast against the timber. Galleried landing upstairs can provide a dramatic look inside, as can a double height great room. Combine these with feature posts and beams, can create an even more incredible look. Split for levels, feature doorways and arches, bespoke lighting and so on, can also enhance your log cabin. Hand carved logs and hand etched glass, can create a really unique and custom look, as can a custom staircase. Wrought iron handles, hinges and bespoke switches are worth looking into too. If you have never built a big log cabin before, you may be surprised at how much space you actually need! Unlike more conventional construction methods, where materials tend to arrive on site in smaller deliveries, log cabins often need a lot of material arrive at one time. This is because you often need all of the logs to arrive together, so that you can sort and have all the logs ready for construction, in the right order. As all logs intersect with other log walls, it is not possible to build a small corner of a house first for example, which you could do with other construction types. Sorting out all the logs for a large log cabin does take a lot of space (I have personally done quite a few), so do not under estimate this and leave no room to move on site! You will also probably need room for cranes or forklifts on site, as larger logs on big log cabins will be too heavy to move manually. 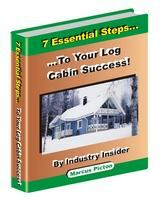 Plan ahead and ensure you have room to build your log cabin effectively and safely.